WAG! The Musical is composer and lyricist Aleksey Shegolev’s second full-length musical and it is the first to be performed in an off-Broadway theatre in New York during the summer of 2013. The idea for the plot was inspired by William Shakespeare’s Love’s Labours Lost, where he and his collaborator Julian Silverman created a story fit for modern times. Good storytelling and strong songwriting depends on the characters having a goal to pursue as they overcome the obstacles in their paths. As the story progresses, the level of intensity must always rise to keep the audiences’ attention. 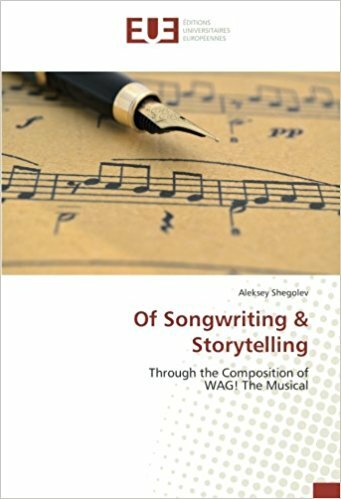 Jazz and rock ‘n’ roll were the main musical influences on this piece and this book will show how rhythm, harmony and texture played a part in creating WAG!. Musicalizing comedy by using various techniques in composition is another topic that will be explored. Finally, Shegolev closes with his personal experiences during the workshop from dealing with the director to the endless revisions and cuts that had to be made before opening night. On July 18th, 2017, Pascale Spinney sang Ava Maria at the Santa Fe Opera’s Apprentice Singer Concert. Ava Maria is an aria from Maisonneuve & Mance where Spinney took on the role of Jeanne Mance. After completing Auguste Descarries’ Quatuor, Shegolev was encouraged to write an academic article about his experience. Entitled Le language musical d’Auguste Descarries (1896-1958): Le point de vie d’un compositor chargé de l’achèvement de son Quatuour pour violin, alto, violoncello et piano, it was published in Les Cahiers Society québécois de recherche en musique Vol 16 Nos 1 & 2 – 2015. Odile Tremblay from Le Devoir featured Louise Gareau-Desbois and Aleksey Shegolev’s opera Maisonneuve & Mance as well as touching upon the difficulities of developing new artistic material in Quebec. Aleksey Shegolev penned this article about Star Wars and its recurring themes and leitmotifs for the magazine, La Scena. As he highlights the distinctive experts of music, he explains why the passages are important to the characters and storytelling. Aleksey Shegolev was featured in October 2015’s edition of La Scena Musicale, Montreal’s monthly bilingual magazine dedicated to the promotion of classical music, in which he discussed completing Auguste Descarries’s unfinished Quatuor pour violon alto, violoncelle et piano. Written by Romy-Léa Faustin.